Long and beautiful nails are every woman’s dream, and gel nails can help that dream come true. Breeze through this article to know more on the types of gel nails. “Beauty is skin deep”. But sadly, the world does not like to look at beauty that way. As far as a woman is concerned, her beauty is almost always judged by her hair, her facial features, her smile and her nails. 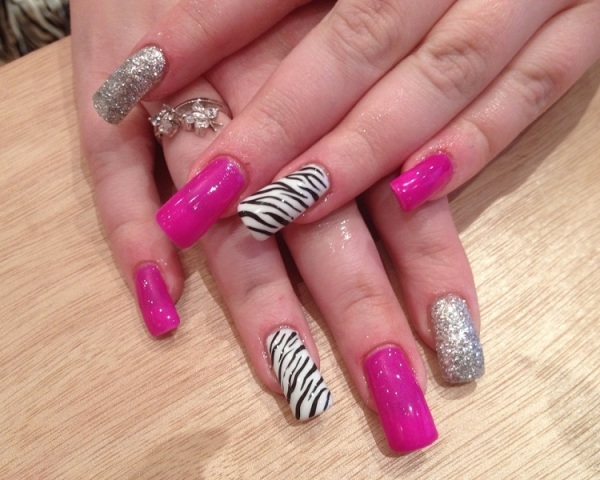 Talking about nails, a woman’s talons can hardly get more striking than beautiful gel nails. Gel nail is to nails what hair color is to hair! If hair color can make a woman’s hair look a lot more striking and lively, gel nails can have the same effect on her nails too. If you are a big fan of that edgy, slightly over-the-top look, gel nails is just what you need. Gel nails have this intrinsic property of looking natural while still managing to look extremely attractive and glossy. Gel nails are also a lot easier to maintain than most other cosmetic nails. Make a move and read on to gain insight into the types of gel nails and the advantages gel nails enjoy over acrylic nails. A gel nail is nail that is treated with gel using ultra violet rays. A light cured gel nail, by definition, is a nail on which a coat of pre-mixed polymer and monomer gel is applied and is then cured with ultraviolet light. To get light cured gel nails, a woman or a man (a man who is more feminine than masculine) have to first apply the gel on their nails and then get it cured under ultra violet light for a minute or so. The ultra violet light is usually ‘sourced’ from ultraviolet light equipment. The difference between light cured gel nails and no-light gel nails is pretty obvious. Light cured gel nails are treated with ultraviolet light and no-light gel nails are not. The difference really is as simple as that. No-light gel nails come only with the gel and sans the ultra violet light and the ultraviolet light equipment. No-light gel nails are slightly more popular than light cured gel nails because they come with the added advantage of convenience. No-light gel nails are cured with a special gel activator that is either brushed or sprayed onto the nail. Alternatively, no-light gel nails can also be cured by dipping the nail in a bowl of water. Although acrylic nails enjoy more popularity over gel nails, gel nails still boast of certain noteworthy advantages over acrylic nails. As far as looks go, gel nails tend to look more natural and glossy than cosmetic nails. The time required to cure a gel nail is always lesser than the time required to cure an acrylic nails. Gel nails require just a little more than two minutes of curing time, as opposed to the time required by acrylic nails. Gel nail mixtures are odorless, which helps it score over strong smelling acrylic nail mixtures. Gel nails are also a lot more fun than acrylic nails since they require less filing and filling during the application process. Lastly, gel nails in general have proven to be less harmful than acrylic nails. In other words, acrylic nails can harm your natural nails much more than gel nails can. It is also almost impossible to grow out acrylic nails, obviously owing to the fact that acrylic nails are artificial.